Proverbs of the wise (22:17-24:24). The Proverbs of Solomon were probably edited in Hezekiah’s day (25-29). The teachings of Agur of Massa (30). The teachings of the mother of King Lemuel of Massa (31). We aren’t certain of the origin of the sayings of Agur the son of Jakeh (chap. 30). But the authorship of the majority of the Proverbs was Solomon himself. Wisdom is more than mere intelligence. In his book Outliers (2008), Malcolm Gladwell interviews Christopher Langan, who is acclaimed as the smartest man in America, and maybe the world. His IQ is somewhere between 190 and 210. He earned a perfect score on the SAT—even though he took a nap during the test. He dropped out of college after his first year because of financial problems. He felt that he had more to teach his professors, than learn from them. When Gladwell published his book, Langan worked at a bar as a bouncer. In our culture, we are awash in a flood of information, but we are starving for wisdom. We have trivia and facts at our fingertips, but are we living any better? Warren Wiersbe writes, “Proverbs tells you, not how to make a living, but how to be skillful in the lost art of making a life.” Wisdom is the ability to know how to use the knowledge that we possess. Wisdom is the big picture, rather than just endless details. These two men are giving the same wisdom, but for totally different reasons. Wisdom in the Bible is rooted in the “fear of God” (Prov. 1:7; 9:10; Ps. 111:10; Job 28:28). These are short and memorable maxims—not technically precise. They aren’t universal moral commands, but general wisdom principles. Who is Solomon? Solomon was one of the early kings of Israel (~950 BC). He received wisdom because he asked God for it to lead Israel. (1 Kings 4:30-34 NLT) [Solomon’s] wisdom exceeded that of all the wise men of the East and the wise men of Egypt. 31 He was wiser than anyone else, including Ethan the Ezrahite and the sons of Mahol—Heman, Calcol, and Darda. His fame spread throughout all the surrounding nations. 32 He composed some 3,000 proverbs and wrote 1,005 songs. 33 He could speak with authority about all kinds of plants, from the great cedar of Lebanon to the tiny hyssop that grows from cracks in a wall. He could also speak about animals, birds, small creatures, and fish. 34 And kings from every nation sent their ambassadors to listen to the wisdom of Solomon. “Wisdom” (hokmah) derives from a word meaning “skillful” (Ex. 31:1-3). The Hebrew word refers to being skilled at weaving, woodworking, and metalworking (Ex. 28:3 “skilled” “wisdom”). It refers to being skilled at sailing (Ps. 107:27). It refers to being skilled at leadership (Isa. 11:2-4). 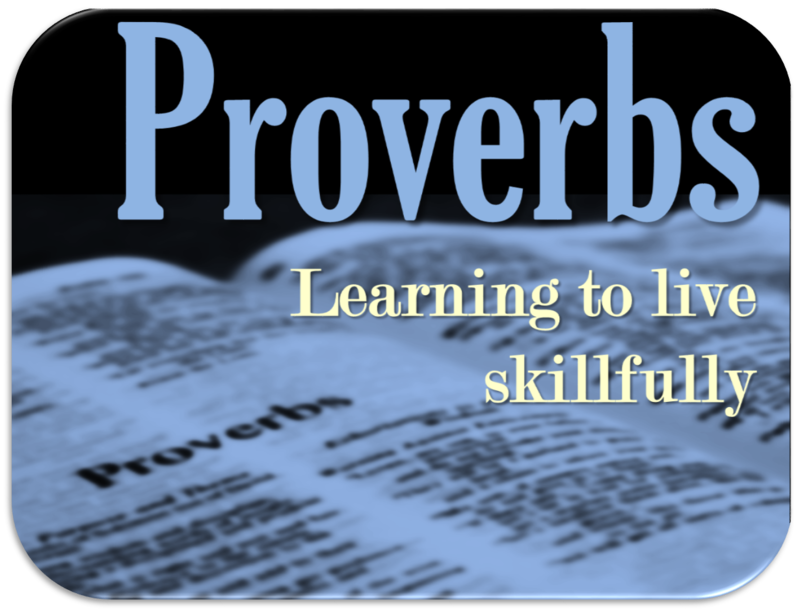 In Proverbs, this refers to being skilled at living life. When I was a kid, we had a lumberjack come and cut down a massive weeping willow tree in our back yard. He pulled out the tiniest chainsaw that he owned, and he made a few surgical slices into the tree. A half hour later, the tree fell to the ground! “Discipline” (mûsār) means instruction or correction. “Understanding” (yadaw) is more than merely intellectual or cognitive. We need to live it in order to truly comprehend it (cf. Isa. 6:10). Part of wisdom is knowing the right way in foggy situations and doing the right thing. “Prudence” (haśkêl) means being attentive or observing carefully (cf. Ps. 41:2). By internalizing it, you become insightful and deep. “Simple” (peti) are simple-minded and naïve. They don’t know why they keep getting hurt (Prov. 14:15; 22:3). The Proverbs don’t talk about self-disciple as much as receiving instruction, processing it, and internalizing it. Why does he call wisdom a “riddle”? God has hidden himself only for those who desire to seek him and know him deeply. God’s wisdom is available to all, but only the humble and teachable will get access. Later we will read, “It is God’s privilege to conceal things and the king’s privilege to discover them” (Prov. 25:2 NLT). Also we read, “Tune your ears to wisdom, and concentrate on understanding. 3 Cry out for insight, and ask for understanding. 4 Search for them as you would for silver; seek them like hidden treasures. 5 Then you will understand what it means to fear the Lord, and you will gain knowledge of God. 6 For the Lord grants wisdom! From his mouth come knowledge and understanding. 7 He grants a treasure of common sense to the honest” (Prov. 2:2-7 NLT). Do you want wisdom? If you don’t, then God will not shove it down your throat. “Fools” (ĕwîl) refers to a thick-headed fool (Prov. 27:22). Solomon later personifies wisdom, showing people’s reactions to it (Prov. 1:30-33). 8 Hear, my son, your father’s instruction and do not forsake your mother’s teaching [torah]. This isn’t a moral law, but like the “law of gravity.” You don’t break it, but it breaks you. We’ve lost moral language in our culture. We call somebody an idiot or a moron. God calls us a fool. God offers us a number of rewards from studying this book: discipline (v.2), insight (v.2), being fair (v.3), wisdom to the simple (v.4), more wisdom to the wise (v.5), discernment (v.5), and fearing God (v.6). We don’t have to learn the hard way. We can learn wisdom in advance. God desires to be a father to us and teach us. The psalmist writes, “Father to the fatherless, defender of widows—this is God, whose dwelling is holy. God places the lonely in families; he sets the prisoners free and gives them joy. But he makes the rebellious live in a sun-scorched land” (Ps. 68:5-6). To start this series, you should come to faith in Christ, because he is the starting point. Jesus said about himself, “Something greater than Solomon is here” (Mt. 12:42). The reason for being a fool is our fault. We heard wisdom from others, but we wouldn’t listen (v.24). This leads to us being overwhelmed (v.27). Do you want to be overwhelmed in times of suffering and pain? We should listen to the Proverbs for how to learn to be sustained during these times. There is a limited amount of time for us to learn wisdom (v.28). Our decisions have a real impact on the world and our lives. By making foolish decisions, we can be plunged into a period of intense regret (v.31-33). (Jas. 3:1-12) Let not many of you become teachers, my brethren, knowing that as such we will incur a stricter judgment. 2 For we all stumble in many ways. If anyone does not stumble in what he says, he is a perfect man, able to bridle the whole body as well. 3 Now if we put the bits into the horses’ mouths so that they will obey us, we direct their entire body as well. 4 Look at the ships also, though they are so great and are driven by strong winds, are still directed by a very small rudder wherever the inclination of the pilot desires. 5 So also the tongue is a small part of the body, and yet it boasts of great things. See how great a forest is set aflame by such a small fire! 6 And the tongue is a fire, the very world of iniquity; the tongue is set among our members as that which defiles the entire body, and sets on fire the course of our life, and is set on fire by hell. 7 For every species of beasts and birds, of reptiles and creatures of the sea, is tamed and has been tamed by the human race. 8 But no one can tame the tongue; it is a restless evil and full of deadly poison. 9 With it we bless our Lord and Father, and with it we curse men, who have been made in the likeness of God; 10 from the same mouth come both blessing and cursing. My brethren, these things ought not to be this way. 11 Does a fountain send out from the same opening both fresh and bitter water? 12 Can a fig tree, my brethren, produce olives, or a vine produce figs? Nor can salt water produce fresh. James offers three analogies for why taming the tongue is so important: the bits in the horse’s mouth (v.3), a small rudder on a ship (v.4), and a forest fire because of a small flame (v.5). James uses very strong language to describe the tongue (“restless evil” “full of deadly poison”). This sounds like language one would use for describing a character in a horror movie! DISCUSSION QUESTION: How do these verses apply to us practically? Can you think of an experience that you have had that proves the truth of these principles? (Prov. 3:11-12) My son, do not despise the Lord’s discipline and do not resent his rebuke, 12 because the Lord disciplines those he loves, as a father the son he delights in. (Prov. 9:8-9) Do not rebuke a mocker or he will hate you; rebuke a wise man and he will love you. 9 Instruct a wise man and he will be wiser still; teach a righteous man and he will add to his learning. (Prov. 10:17) He who heeds discipline shows the way to life, but whoever ignores correction leads others astray. We’re not fit to lead others until we are able to be corrected ourselves. (Prov. 12:1) Whoever loves discipline loves knowledge, but he who hates correction is stupid. (Prov. 12:15) The way of a fool seems right to him, but a wise man listens to advice. (Prov. 13:1) A wise son heeds his father’s instruction, but a mocker does not listen to rebuke. (Prov. 13:10) Pride only breeds quarrels, but wisdom is found in those who take advice. (Prov. 13:13) He who scorns instruction will pay for it, but he who respects a command is rewarded. (Prov. 13:18) He who ignores discipline comes to poverty and shame, but whoever heeds correction is honored. (Prov. 13:24) He who spares the rod hates his son, but he who loves him is careful to discipline him. (Prov. 15:5) A fool spurns his father’s discipline, but whoever heeds correction shows prudence. (Prov. 15:10) Stern discipline awaits him who leaves the path; he who hates correction will die. (Prov. 15:12) A mocker resents correction; he will not consult the wise. (Prov. 15:31-32) He who listens to a life-giving rebuke will be at home among the wise. 32 He who ignores discipline despises himself, but whoever heeds correction gains understanding. (Prov. 17:10) A rebuke impresses a man of discernment more than a hundred lashes a fool. (Prov. 19:18) Discipline your son, for in that there is hope; do not be a willing party to his death. (Prov. 19:20) Listen to advice and accept instruction, and in the end you will be wise. When would this not be the case? How can we tell when a rebuke or advice is from God or not from God? (Prov. 19:25) Flog a mocker, and the simple will learn prudence; rebuke a discerning man, and he will gain knowledge. (Prov. 19:27) Stop listening to instruction, my son, and you will stray from the words of knowledge. (Prov. 22:19) Folly is bound up in the heart of a child, but the rod of discipline will drive it far from him. (Prov. 23:13-14) Do not withhold discipline from a child; if you punish him with the rod, he will not die. 14 Punish him with the rod and save his soul from death. (Prov. 25:12) Like an earring of gold or an ornament of fine gold is a wise man’s rebuke to a listening ear. (Prov. 25:15) Through patience a ruler can be persuaded, and a gentle tongue can break a bone. When working with young Christians, we need to be patient with them. (Prov. 27:5-6) Better is open rebuke than hidden love. 6 Wounds from a friend can be trusted, but an enemy multiplies kisses. (Prov. 28:23) He who rebukes a man will in the end gain more favor than he who has a flattering tongue. (Eccl. 4:13) Better a poor but wise youth than an old but foolish king who no longer knows how to take warning. (Eccl. 7:5) It is better to listen to the rebuke of a wise man than for one to listen to the song of fools. DISCUSSION QUESTION: How do these verses apply in your own life, or in the lives of others? For a few of these proverbs, make sure to (1) explain the imagery in your own words, and (2) think of a situation where you’ve seen this wisdom principle play out. Also consider asking the questions listed below a few of these proverbs for discussion. (Prov. 26:17) Like one who seizes a dog by the ears is a passer-by who meddles in a quarrel not his own. When would it would it be necessary to be a peace-maker and help? When would we not help out, as this passage teaches? (Prov. 26:20-21) Without wood a fire goes out; without gossip a quarrel dies down. 21 As charcoal to embers and as wood to fire, so is a quarrelsome man for kindling strife. (Prov. 26:26) His malice may be concealed by deception, but his wickedness will be exposed in the assembly. (Prov. 3:31-32) Do not envy a violent man or choose any of his ways, 32 for the Lord detests a perverse man but takes the upright into his confidence. (Prov. 14:29) A patient man has great understanding, but a quick-tempered man displays folly. (Prov. 15:18) A hot-tempered man stirs up dissension, but a patient man calms a quarrel. (Prov. 15:22) Plans fail for lack of counsel, but with many advisers they succeed. (Prov. 17:14) Starting a quarrel is like breaching a dam; so drop the matter before a dispute breaks out. (Prov. 17:24) A man of knowledge uses words with restraint, and a man of understanding is even-tempered. (Prov. 19:19) A hot-tempered man must pay the penalty; if you rescue him, you will have to do it again. (Prov. 29:11) A fool gives full vent to his anger, but a wise man keeps himself under control. (Prov. 29:22) An angry man stirs up dissension, and a hot-tempered one commits many sins. (Prov. 12:16) A fool shows his annoyance at once, but a prudent man overlooks an insult. (Prov. 19:11) A man’s wisdom gives him patience; it is to his glory to overlook an offense. What is the difference between being a “passive doormat” versus “overlooking an offense”? (Eph. 4:26-27) Be angry, and yet do not sin; do not let the sun go down on your anger, 27 and do not give the devil an opportunity. Based on verse 26, what is the difference between righteous and unrighteous anger? God has righteous anger (Eph. 5:6), and Jesus showed righteous anger in clearing the Temple (Jn. 2). We’re also called to be “slow to anger” (Jas. 1:19-20). What are some examples of righteous anger? What is the difference between righteous and unrighteous anger? In what way do you think Satan might use unrighteous anger in Christian community? (Prov. 3:34) He mocks proud mockers but gives grace to the humble. (Prov. 11:2) When pride comes, then comes disgrace, but with humility comes wisdom. (Prov. 15:33) The fear of the Lord teaches a man wisdom, and humility comes before honor. (Prov. 16:18) Pride goes before destruction, a haughty spirit before a fall. (Prov. 27:2) Let another praise you, and not your own mouth; someone else, and not your own lips. (Prov. 1:19) Such is the end of all who go after ill-gotten gain; it takes away the lives of those who get it. (Prov. 3:9-10) Honor the Lord with your wealth, with the firstfruits of all your crops; 10 then your barns will be filled to overflowing, and your vats will brim over with new wine. (Prov. 11:4) Wealth is worthless in the day of wrath, but righteousness delivers from death. (Prov. 11:28) Whoever trusts in his riches will fall, but the righteous will thrive like a green leaf. (Prov. 12:9) Better to be a nobody and yet have a servant than pretend to be somebody and have no food. (Prov. 14:20-21) The poor are shunned even by their neighbors, but the rich have many friends. 21 He who despises his neighbor sins, but blessed is he who is kind to the needy. (Prov. 14:30) A heart at peace gives life to the body, but envy rots the bones. (Prov. 14:31) He who oppresses the poor shows contempt for their Maker, but whoever is kind to the needy honors God. (Prov. 15:12) Better a little with the fear of the Lord than great wealth with turmoil. (Prov. 16:8) Better a little with righteousness than much gain with injustice. (Prov. 17:5) He who mocks the poor shows contempt for their Maker. (Prov. 19:17) He who is kind to the poor lends to the Lord, and he will reward him for what he has done. (Prov. 21:13) If a man shuts his ears to the cry of the poor, he too will cry out and not be answered. (Prov. 22:9) A generous man will himself be blessed, for he shares his food with the poor. (Prov. 22:22-23) Do not exploit the poor because they are poor and do not crush the needy in court, 23 for the Lord will take up their case and will plunder those who plunder them. (Prov. 23:4-5) Do not wear yourself out to get rich; have the wisdom to show restraint. 5 Cast but a glance at riches, and they are gone, for they will surely sprout wings and fly off to the sky like an eagle. (Prov. 28:20) A faithful man will be richly blessed, but one eager to get rich will not go unpunished. (Prov. 28:27) He who gives to the poor will lack nothing, but he who closes his eyes to them receives many curses. (Prov. 30:8-9) Keep falsehood and lies far from me; give me neither poverty nor riches, but give me only my daily bread. 9 Otherwise, I may have too much and disown you and say, ‘Who is the Lord?’ Or I may become poor and steal, and so dishonor the name of my God. (Eccl. 5:10-16) Whoever loves money never has money enough; whoever loves wealth is never satisfied with his income. This too is meaningless. 11 As goods increase, so do those who consume them. And what benefit are they to the owner except to feast his eyes on them? 12 The sleep of a laborer is sweet, whether he eats little or much, but the abundance of a rich man permits him no sleep. 13 I have seen a grievous evil under the sun: wealth hoarded to the harm of its owner, 14 or wealth lost through some misfortune, so that when he has a son there is nothing left for him. 15 Naked a man comes from his mother’s womb, and as he comes, so he departs. He takes nothing from his labor that he can carry in his hand. 16 This too is a grievous evil: As a man comes, so he departs, and what does he gain, since he toils for the wind? (Eccl. 6:2-3, 6-7) God gives a man wealth, possessions and honor, so that he lacks nothing his heart desires, but God does not enable him to enjoy them, and a stranger enjoys them instead. This is meaningless, a grievous evil. 3 A man may have a hundred children and live many years; yet no matter how long he lives, if he cannot enjoy his prosperity and does not receive proper burial, I say that a stillborn child is better off than he… even if he lives a thousand years twice over but fails to enjoy his prosperity. Do not all go to the same place? 7 All man’s efforts are for his mouth, yet his appetite is never satisfied. (Eccl. 7:2) It is better to go to a house of mourning than to go to a house of feasting, because that is the end of every man, and the living takes it to heart. (Eccl. 8:8) No man has power over the wind to contain it; so no one has power over the day of his death. (Prov. 20:6) Many a man claims to have unfailing love, but a faithful man who can find? (Prov. 13:20) He who walks with the wise grows wise, but a companion of fools suffers harm. (Prov. 17:17) A friend loves at all times, and a brother is born for adversity. (Prov. 18:24) A man of many companions may come to ruin, but there is a friend who sticks closer than a brother. (Prov. 27:17) As iron sharpens iron, so one man sharpens another. (Prov. 5:6) She gives no thought to the way of life; her paths are crooked, but she knows it not. (Prov. 6:25-29) Do not lust in your heart after her beauty or let her captivate you with her eyes, 26 for the prostitute reduces you to a loaf of bread, and the adulteress preys upon your very life. 27 Can a man scoop fire into his lap without his clothes being burned? 28 Can a man walk on hot coals without his feet being scorched? 29 So is he who sleeps with another man’s wife; no one who touches her will go unpunished. (Prov. 11:22) Like a gold ring in a pig’s snout is a beautiful woman who shows no discretion. (Prov. 12:4) A wife of noble character is her husband’s crown, but a disgraceful wife is like decay in his bones. (Prov. 21:9) Better to live on a corner of the roof than share a house with a quarrelsome wife. (Prov. 21:19) Better to live in a desert than with a quarrelsome and ill-tempered wife. (Prov. 25:24) Better to live on a corner of the roof than share a house with a quarrelsome wife. (Prov. 27:15-16) A quarrelsome wife is like a constant dripping on a rainy day; 16 restraining her is like restraining the wind or grasping oil with the hand. (Gen. 2:15) Then the Lord God took the man and put him into the garden of Eden to cultivate it and keep it. Since we are made in God’s image (Jas. 3:9; Gen. 1:26-27), this is part of being an image-bearer (Gen. 2:15). (Prov. 6:6-11) Go to the ant, you sluggard; consider its ways and be wise! 7 It has no commander, no overseer or ruler, 8 yet it stores its provisions in summer and gathers its food at harvest. 9 How long will you lie there, you sluggard? When will you get up from your sleep? 10 A little sleep, a little slumber, a little folding of the hands to rest— 11 and poverty will come on you like a bandit and scarcity like an armed man. The hardworking man doesn’t need someone to be on his case. He’s self-initiative (v.7). They exaggerate how much rest they need (v.10). (Prov. 10:4) Lazy hands make a man poor, but diligent hands bring wealth. (Prov. 10:15) The wealth of the rich is their fortified city, but poverty is the ruin of the poor. (Prov. 10:26) As vinegar to the teeth and smoke to the eyes, so is a sluggard to those who send him. One Bible teacher took a mouthful of vinegar and swished it around his mouth like Scope to test this Proverb. He showed the video when he taught it. He described it as a burning sensation. We’ve all had smoke curl up into our eyes, and it burns our eyes. (Prov. 12:24) Diligent hands will rule, but laziness ends in slave labor. Those who perpetually work at minimum wage in our culture really can never get out of their poverty. (Prov. 12:27) The lazy man does not roast his game, but the diligent man prizes his possessions. In this time period, they would hunt for their food. They needed to roast their game before it spoiled. This lazy man would hunt, but wouldn’t roast it before it spoiled. The lazy person doesn’t finish what he starts. He spends all of this time hunting, but never gets the reward of his effort. If only he did a little bit more, he would’ve been able to enjoy it. The lazy person passes off responsibility, rather than finishing their job. (Prov. 13:4) The sluggard craves and gets nothing, but the desires of the diligent are fully satisfied. The sluggard has desires, but it never translates into action. (Prov. 13:11) Dishonest money dwindles away, but he who gathers money little by little makes it grow. The “get rich quick” schemer doesn’t really value what he has. So he slowly loses it. When lazy people come into money, they often spend it foolishly. (Prov. 14:23) All hard work brings a profit, but mere talk leads only to poverty. The sluggard likes to talk about their problem, but they don’t like to do anything about it. (Prov. 15:19) The way of the sluggard is blocked with thorns, but the path of the upright is a highway. This strikes us as an issue with their attitude and perspective. The sluggard feels like their life is circumstantially poor. This might also be that the hard worker will take the longer route on the highway. The sluggard will take the shorter route that is filled with thorns. (Prov. 19:15) Laziness brings on deep sleep, and the shiftless man goes hungry. (Prov. 20:13) Do not love sleep or you will grow poor; stay awake and you will have food to spare. (Prov. 21:17) He who loves pleasure will become poor; whoever loves wine and oil will never be rich. The sluggard uses their money on frivolous things or even addictions. (Prov. 21:25-26) The sluggard’s craving will be the death of him, because his hands refuse to work. 26 All day long he craves for more, but the righteous give without sparing. This reminds us of 13:4. By contrast, the righteous works hard in order to have something to give to others. Paul writes, “He who steals must steal no longer; but rather he must labor, performing with his own hands what is good, so that he will have something to share with one who has need” (Eph. 4:28). (Prov. 24:30-34) I went past the field of the sluggard, past the vineyard of the man who lacks judgment; 31 thorns had come up everywhere, the ground was covered with weeds, and the stone wall was in ruins. 32 I applied my heart to what I observed and learned a lesson from what I saw: 33 A little sleep, a little slumber, a little folding of the hands to rest— 34 and poverty will come on you like a bandit and scarcity like an armed man. (Prov. 26:13-16) The sluggard says, “There is a lion in the road, a fierce lion roaming the streets!” 14 As a door turns on its hinges, so a sluggard turns on his bed. 15 The sluggard buries his hand in the dish; he is too lazy to bring it back to his mouth. 16 The sluggard is wiser in his own eyes than seven men who answer discreetly. Is it that the lion is imaginary? He’s exaggerating his circumstances (v.13). He’s expecting the lion before he even gets out of bed! Picture the sound of a noisy hinge, as the door slowly opens (v.14). The sluggard moans the same way in their bed. They are so lazy that they can’t even feed themselves (v.15). He’s so deceived about his own wisdom (v.16). It seems like a cocktail of delusion, deception, and pride all at once. (2 Thess. 3:6-15) In the name of the Lord Jesus Christ, we command you, brothers, to keep away from every brother who is idle and does not live according to the teaching you received from us. 7 For you yourselves know how you ought to follow our example. We were not idle when we were with you, 8 nor did we eat anyone’s food without paying for it. On the contrary, we worked night and day, laboring and toiling so that we would not be a burden to any of you. 9 We did this, not because we do not have the right to such help, but in order to make ourselves a model for you to follow. 10 For even when we were with you, we gave you this rule: “If a man will not work, he shall not eat.” 11 We hear that some among you are idle. They are not busy; they are busybodies. 12 Such people we command and urge in the Lord Jesus Christ to settle down and earn the bread they eat. 13 And as for you, brothers, never tire of doing what is right. 14 If anyone does not obey our instruction in this letter, take special note of him. Do not associate with him, in order that he may feel ashamed. 15 Yet do not regard him as an enemy, but warn him as a brother. Consider this article from Jessica Firger “Junk food makes you lazy, not just fat, study suggests.” CBS News (2014). A new study finds eating too much junk food doesn’t only make you fat, it may also make you mentally slower or less motivated. At least that seems to be true in lab rats. For the study, published in the journal Physiology and Behavior, researchers at the University of California Los Angeles put rats on two different diets. Half of the rodents ate a healthy diet of unprocessed foods, such as ground corn and fish meal. The remaining half were given a high sugar, highly processed diet, similar to the junk food humans consume. Within three months, the researchers observed remarkable differences between the two groups of rats. Mostly, they found the rats on the junk food diet were significantly fatter than the rats on a healthy diet. But the unhealthy rats were also less motivated, indicating that a poor diet had a serious impact on their tiny rodent brains. When the researchers put the rats through certain tasks the differences become even more apparent. All of the rats were required to press a lever for a reward of food and water. The rats on the junk food diet were slower to act on the task, even though this reward system was clearly laid out and they knew performing the task would provide them with more food and water. The rats on the unhealthy diet took breaks that averaged around 10 minutes long, versus the healthy rats whose breaks lasted for about five minutes each. At the 6-month mark, the researchers switched the diets for the two groups of rats, giving the fat rats a healthy diet and the lean rats an unhealthy diet. The overweight rats ate a healthy diet for nine days. However, the change in diet didn’t help the unhealthy rats lose weight or improve their ability to perform tasks. Similarly the healthy rats didn’t get fatter on the unhealthy diet and didn’t become less motivated to fulfill certain tasks. Additionally, the rats on the unhealthy diets were found to have a large number of tumors throughout their bodies, while the healthy rats had much smaller and fewer tumors. Aaron Blaisdell, a professor of the psychology at UCLA’s Brain Research Institute and lead researcher, says the weight and behavioral differences may indicate that junk food chemically changes the brain. Unless otherwise specified, this study uses the NIV translation. While we normally prefer the NASB, it is often too word-for-word to be useful for the proverbs, which often carry idiom or nuance. Archer, Gleason. A survey of Old Testament introduction (3rd. ed.). Chicago: Moody Press. 1994. 518. Roger T. Beckwith, The Old Testament Canon of the New Testament Church and Its Background in Early Judaism (Grand Rapids, MI: Wipf & Stock Publishers, 1986), 76-77. Warren Wiersbe Be Skillful, 1996.